These wearable riffs on blue and gold make striking accessories for music and design lovers alike. In search of a unique shape, Naomi Celestin pinched either end of a springy circle of bronze and steel guitar string, creating an organic pod that cradles a collection of turquoise-dyed Howlite beads. Naomi's primary interest is art, but she was born into a family of New Orleans musicians. So she combined her interests and influences in her reclaimed guitar string jewelry designs. Her wearable riffs on blue and gold make striking accessories for music and design lovers alike. 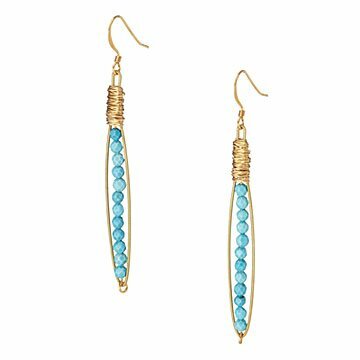 Includes hypoallergenic, gold-plated ear wires. Handmade in New Orleans by Naomi and a small team of women artisans. Make it a set! Click here to see the matching Reclaimed Guitar String Necklace and Reclaimed Guitar String Bracelet. This is a unique gift. Both my son and his girlfriend play guitar, so I thought these would be a good conversational piece when worn.